How was your weekend? Good? My weekend was busy but fun. An old friend of mine who I will call “J.B.” invited me to a public screening of Back to the Future Parts 1 & 2. J.B. and I haven’t seen each other since high school and had been trying to get together, so this was the perfect opportunity for us to catch up. Also I had already seen (and reviewed) the first one, but had never seen the second one. This is my review of Back to the Future Part II, just in time for October 21, 2015! Back to the Future Part II quite literally takes place right after the first installment (I say “quite literally” because the first movie ended with Marty and Doc going on their next adventure). 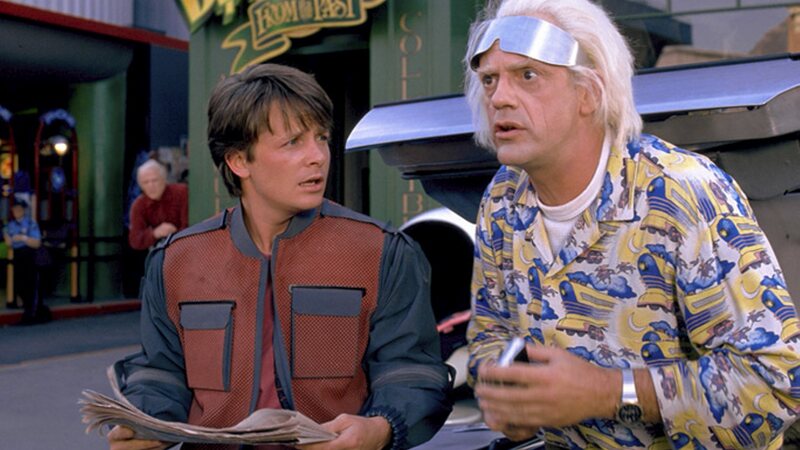 In the sequel, Marty McFly and Dr. Emmett Brown “Doc” find themselves in the year 2015, where they first have to prevent Marty’s future son from being arrested. Then they have to make sure Marty’s girlfriend Jennifer doesn’t come across her future self…and then they have to stop the villanous Biff Tannen from messing around with the timeline of the first film. Fear not, my dear reader. There is a reason for the sloppy plot summary and I will get to that in the Hits and Misses. As a newbie convert to the Back to the Future franchise, I have to say that I am in love with Marty and Doc’s relationship. Their friendship is the glue that holds the trilogy together. Something that J.B. and I talked about was how Part II expands their dynamic, leading to some great character development. Marty is the naive brawn while Doc is the brilliant brain. However, Doc’s head is so packed with complex ideas that it’s easy for a simple thought to slip past him, while Marty’s lack of foresight makes room in his mind for a clever idea. This means that Marty can act in a tense situation while Doc can plan for scenarios before they happen. These two oddball souls balance each other out and their bond is more fulfilling than any other relationship they will ever have. I think that not making them father and son adds to their relationship because it means these two unrelated people have made the choice to stick together and become their own family. The only thing they gain from being around one another is understanding and adventure. I know I’m going to be really sad when I finally watch Part III and have to see my favorite movie duo end their story. Honestly, I’m so tempted just to scrap this review and turn this into a CGB editorial on Marty and Doc’s friendship. These two characters are like Francis and Clare of Assisi; they’re two different people on the same mission and that’s why I love them so much. Just like in the first film, it still bothers me that we never learn exactly how Marty and Doc met. Because I’m so invested in these two people, I really want to know where this friendship began. I’m open to hearing fan theories. Okay, here’s my explanation for my messy intro: I gave an unfocused summary because Back to the Future Part II is very unfocused. The first film was about a teen who gets stuck in the past and must get his future parents together, as well as find a way back to the present. In the second film, Marty and Doc have a series of side missions before the real conflict happens. The episodic story formula is very hard to pull off because you run the risk into having your story feel like three different stories crammed into one. Part II is like Amelie (2001) and The Walk (2015) in that there are a series of mini-conflicts building up to the main conflict. This would be fine except that it makes it hard for the audience to care about the main conflict because so little time is invested in it. Now to the movie’s credit, it does weave Biff Tannen into the story very well so that he has presence, but that doesn’t save the movie’s scrambled tone. Overall, it is the strength of the characters that keeps Back to the Future afloat. You could put Marty and Doc in any other story and they would be enough to make it great. Here’s to the hope that the October 21st, 2015 prediction is correct and the Cubs do indeed win the World Series.